Trump Budget Request Includes Funds for Border Wall, Military - Integration Through Media ....! 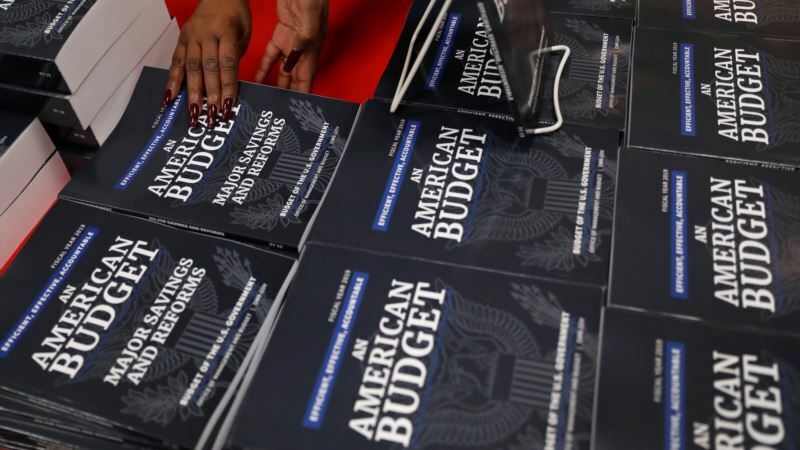 (VOA): U.S. President Donald Trump is sending a $4.4 trillion budget request to Congress that includes money for a southern border wall and building up the military, but is projected to increase the federal deficit by more than $1 trillion. White House officials all but acknowledged the proposal unveiled Monday has little chance of becoming law — Congress alone controls federal government spending. But the White House insisted the budget proposal still sends an important message about Trump's priorities. "This is a messaging document," White House budget director Mick Mulvaney told reporters at a briefing Monday. The Trump budget calls for major cuts to domestic programs such as Medicare, Medicaid and food stamps. But the plan would still not balance the federal budget, in part because of reduced federal revenue due to tax cuts passed last year. Democrats widely rejected the plan. House Minority Leader Nancy Pelosi called the proposal a "brutal collection of broken promises and staggering cuts." The proposal's failure to eliminate debt is also likely to upset some Republicans, who have traditionally opposed budget deficits. "It's simply adjusting to the Washington, D.C., we live in," Mulvaney said, stressing that the new budget plan would help "turn the tide" on national debt. The White House proposal builds on the massive, two-year spending bill passed last week by Congress and signed by the president. That bill includes a major boost for the military, as well as domestic programs. Mulvaney, a former lawmaker and long-time opponent of federal debt, has acknowledged he likely would not have supported the bill were he still in Congress. But he said the new White House proposal does not mean that all of the money approved by Congress must be spent. "These are spending caps, these are not spending floors," he said. Under the two-year budget deal reached last week by Congress, the Pentagon will get a record-high $700 billion for 2018 — fulfilling a Trump campaign pledge. "We took care of the military like it's never been taken care of before," Trump said Monday. But at a White House meeting Monday on infrastructure with state and local officials, Trump said he looked forward to spending more on the U.S. — not overseas. "As of a couple of months ago, we have spent $7 trillion in the Middle East. Seven trillion dollars. What a mistake," Trump said, using an oft-disputed figure about U.S. spending on wars in the Middle East. "We're trying to build roads and bridges and fix bridges that are falling down, and we have a hard time getting the money. It's crazy," Trump said. The budget request is being unveiled along with an infrastructure initiative designed to rebuild what a White House fact sheet calls the nation's "crumbling infrastructure." The plan envisions budgeting $200 billion in federal funds to spur at least $1.5 trillion in infrastructure investments from private investors and state and local governments. But the infrastructure proposal's fate is uncertain. Many members of Trump's Republican Party say they are reluctant to add any additional government spending, especially after passing tax cuts. Many Democrats, meanwhile, want more federal dollars to be used on infrastructure. The proposal also includes $23 billion for border security and immigration enforcement, including $18 billion for a wall along the frontier with Mexico.